Beautiful, large, 3 bed 2 bath 3 car garage, single story home. 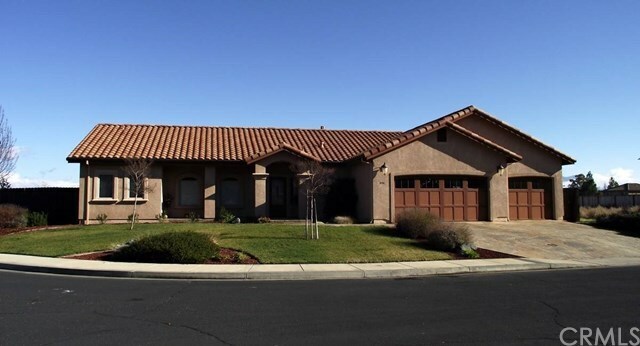 Stucco exterior, on approximately 1/4 acre, private, fenced yard. Built in 2008. Lifetime, fireproof, tile roof. Kitchen & baths have Granite counter tops, & tile floors. Stainless steel appliances. Classic brushed hardware and fixtures. Master bed has huge walk in closet, door out to patio, and a sitting room or baby's room off of it. Master bath has separate shower and Jacuzzi tub, all tile, with several linen closets. There's an over size,796 sq ft 3 car garage, with one side front & back drive through doors. Double gate on the side for parking RV or boat inside gate. Full size Jacuzzi hot tub. Covered stone patio with built in concrete, outdoor BBQ counters. All custom window coverings stay with the house. This house is in excellent condition. Still like brand new. At the end of the court, in an exclusive gated community with a swimming pool. Dues are only $110. a month. Directions: Lakeshore Dr to Gated comunity.